The loan from the Museo Nacional del Prado in Madrid to the Dalí Theatre-Museum of the Raphael painting Madonna of the Rose to the Dalí Theatre-Museum from the Museo del Prado, as part of the exhibition project “On Tour through Spain”, organized by the Prado in commemoration of the museum’s bicentenary was the starting point of the exhibition Dalí-Raphael, a Prolonged Reverie. 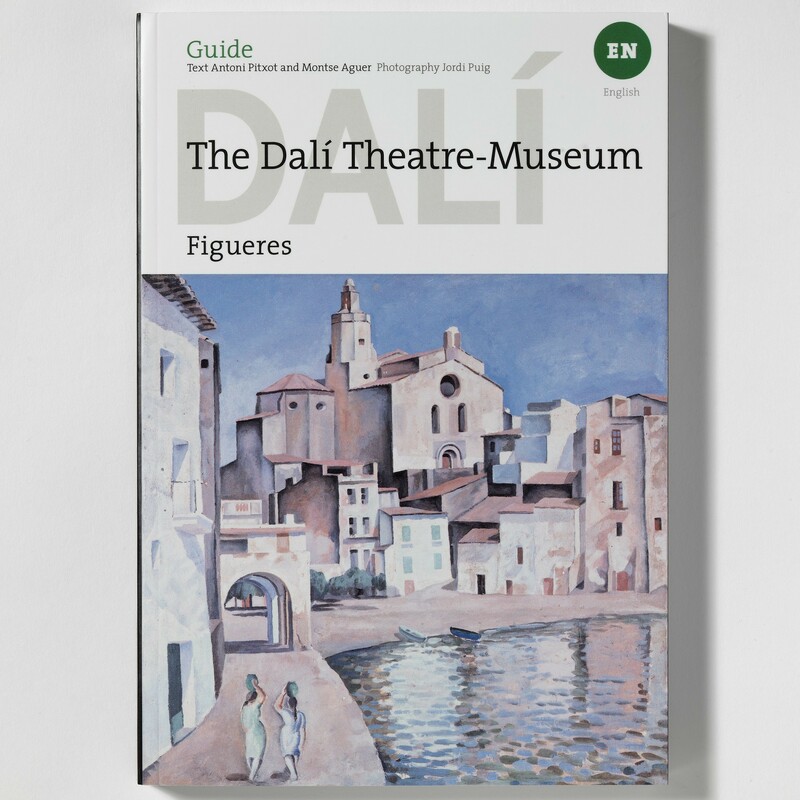 The title comes from Dalí’s 1948 treatise on painting, 50 Secrets of Magic Craftsmanship, in which he pays tribute to the art of painting and its techniques. 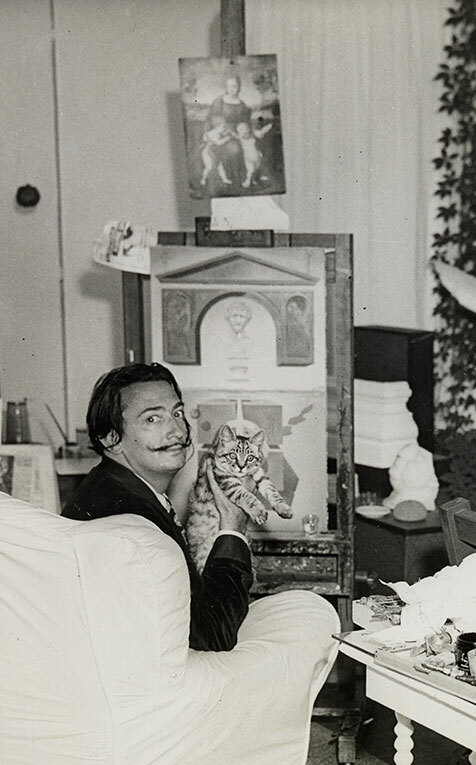 From his first beginnings to his final years, Dalí’s work abounds in references to Raphael and the Renaissance, which allowed him to proclaim both the importance of the great tradition and his own worth as an artist in comparison with his contemporaries. The special affinity between Salvador Dalí and Raphael is made clearly apparent in this exhibition by Dalí’s oil painting The Ascension of Saint Cecilia, which is accompanied here for the first time with studio materials that afford new insights into Dalí’s working process. These photographs of the studios the artist used at different times and in different places, such as Portlligat and Monterey, and the books he referred to in the preparation of his pictures, conserved in the Centre for Dalinian Studies, allow us to recreate something of the process involved in the creation of an exceptional work: The Ascension of Saint Cecilia. Above all, with this exhibition we have the satisfaction of fulfilling one of Salvador Dalí’s greatest wishes: that one of his paintings should hang next to a Raphael. 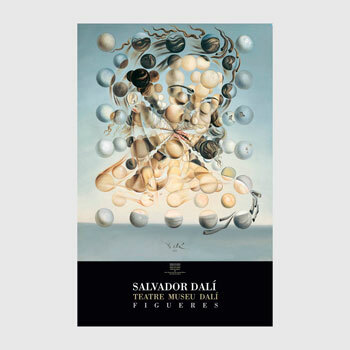 The Fundació Gala-Salvador Dalí is presenting for the first time a show that is developed in two phases. For the second stage of the exhibition, from January 15 until December 2019, following the return of Madonna of the Rose to the Prado, the Raphael painting has been replaced by Dalí’s Explosion of Mystical Faith in the Midst of a Cathedral, a little-known, almost hidden work that cannot usually be seen in its entirety, since it is part of an installation, the altar of the Twisted Christ, under the dome of the Dalí Theatre-Museum in Figueres, where we can only glimpse the reflection of the painting in a mirror. Now, as privileged witnesses, we can contemplate Explosion of Mystical Faith directly, in full, and at close quarters. Painted in Dalí’s Portlligat studio in or around 1955, this is one of a series of works in which classicism is very much in evidence, while at the same time invoking nuclear physics and the discontinuity of matter. This mystical-nuclear interpretation of Raphael’s Saint Catherine of Alexandria (c. 1507) bears witness to Dalí’s ability to express his vision in new languages, following the example of the great masters of the past, and above all to his desire to become classical. The painting depicts the figure of the saint in forms that suggest the horn of a rhinoceros, traditionally considered an emblem of purity and chastity. At the same time Dalí remains true to the landscape that profoundly influenced so much of his work, with the geology of the rocks and a sea that becomes a sky or a sky that becomes sea, in an intended confusion. Untitled. Saint Peter’s Basilica. Explosion of Mystical Faith in the Midst of a Cathedral is one of the most hidden-away, little-known works in the Dalí Theatre-Museum. The painting, on which the artist worked for almost fifteen years in his Portlligat studio, is part of one of the installations under the dome of the museum, on the altar of the Twisted Christ, where it can only be seen reflected in a mirror. The virgin saint is shown surrounded by a nebula, framed in the arch of St. Peter’s basilica in the Vatican, which dominates the work. Dalí was here once again interpreting Raphael, in this case his Saint Catherine of Alexandria, as can be seen in the preparatory drawing for this work. Although the painting is unfinished, as is apparent in the procession in the lower part of the canvas, the composition is harmonious and balanced. The luminous central explosion contrasts with the red, blue, green and yellow, which recall the colours of Dalí’s own The Ascension of Saint Cecilia and those of Raphael’s Saint Catherine of Alexandria. Publifoto: Dalí’s oil painting The Ascencion of Saint Cecilia with the reproduction of Raphael’s Saint Catherine of Alexandria in his studio at Portlligat, c. 1955. 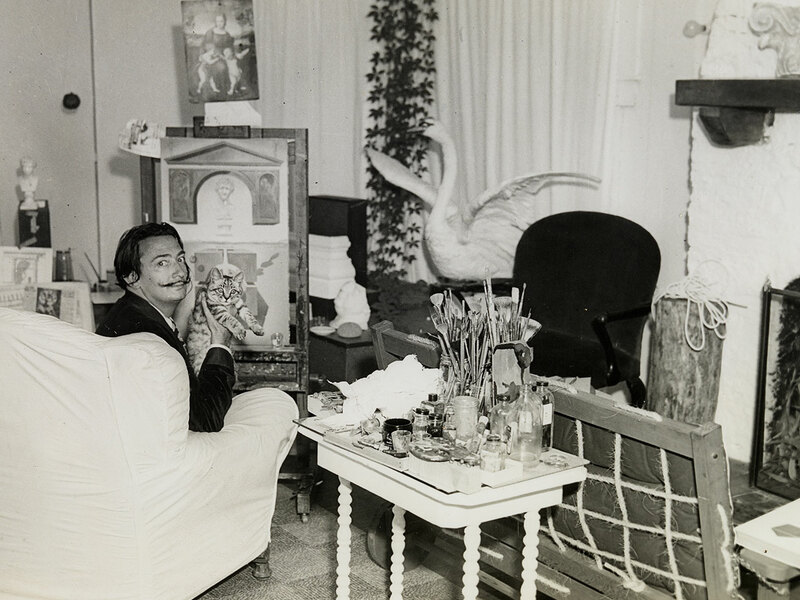 Brassaï, Salvador Dalí painting The Ascension of Saint Cecilia in his studio at Portlligat, 1955. © Estate Brassaï - RMN-Grand Palais.